The pressure is 23.5 atm. This is much too high for a garden hose. For comparison, a stove top pressure cooker has a pressure of about 15 atm. The volume flow rate is too high. $N_R = 5.28 \times 10^6 >> 3000$. The flow is turbulent. This is College Physics Answers with Shaun Dychko. Poiseuille's Law says that the volume flow rate through tube equals the difference in pressure between the two ends times by Pi times the radius of the tube R4 divided by eight times the viscosity of fluid flowing through it times the length of the tube. Now, P2 is what we're trying to find. P1 is atmospheric pressure, the pressure at the mouth of the hose. And so, we'll multiply both sides by eight nu l over Pi r to the fourth. And then, also add P1 to both sides and we solve for P2, eight nu lQ over Pi r to the fourth plus P1, P1 being atmospheric pressure. So we have eight times the viscosity of 1.005 times ten to the minus three Pascals seconds times the garden hose length of 23 meters times the volume flow rate of 50 liters per second converted into cubic meters per second by multiplying by one cubic meter for every 1000 Liters. And we divide that by Pi times the radius converted into meters to the power of four plus atmospheric pressure 1.01 times ten to the five Pascals. And we get 2.37 times ten to the six Pascals, must be the pressure at the beginning of the hose at the faucet. Now in b, we have to make sense of this number. Is it reasonable or not? Well it's divided by atmospheric pressure and we see that this pressure here is 23 and a half atmospheres and that is too high for a garden hose. For comparison, consider a stove top pressure cooker has a pressure of a boat 15 atmospheres and it's made out of steel and that's really strong. Whereas, a garden hose is a flexible tube and we certainly cannot sustain, 15 atmospheres is indefinitely would not sustain, 23 atmospheres either. And this is brought about by the volume flow rate being too high. Now part d, asks us to calculate the Reynold's number. So, Reynold's number is two times the density of the fluid times its speed to the tube times the radius to the tube divided the viscosity of the fluid. 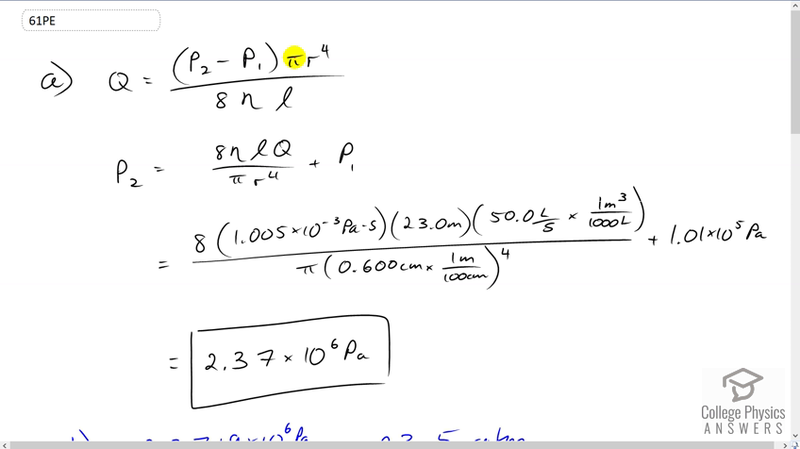 Now, we can figure out V by using the formula for the volume flow rate being the cross-sectional area of the tube times V. Cross-sectional area is Pi r squared. And we can divide both sides by Pi r squared to solve for V, so it's Q over Pi r squared. And we'll substitute that in for V here. And so the Reynold's number is going to be two rho Q over Pi r nu. So that's two times the density of water times its volume flow rate in cubic meters per second divided by Pi times the radius of the garden hose times the viscosity. And this works out to 5.28 times ten to the six which is much much larger than 3000. And so flow is definitely going to be turbulent and because it's so turbulent, this formula up here doesn't even apply actually because this is meant for lavender flow.